This is the third of four articles focused on the Liberating Voices practicums conducted for the two Public Thinking Public Health classes held at Evergreen College at the end of 2009 and beginning of 2010. The earlier articles focused on the overall context for the sessions and the structure of the group breakout work. 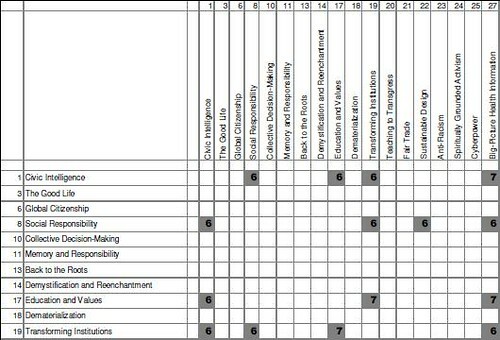 This article focuses on a documentation approach and representative reports generated from the practicums. A secondary objective of the practicums was to explore ways of capturing information that might reveal which patterns or clusters of patterns tend to be more useful in specific settings or domains, and potentially “seed” the development of “sub-languages” for those who would concretely engage in the development and implementation of solutions. Needless to say, the sample of practicum participants was quite small (approximately 50 – 60 different students across the two class sessions; there was little overlap in students between the two classes). The two classes included 10 discrete scenarios or projects under a broad definition of public health that included community wellbeing as well as individual health concerns. Each class used a representative sample of pattern cards consisting of about 65 patterns, although all teams had a complete listing of the 136 patterns published in the book as well as complete reference volumes of the book itself. 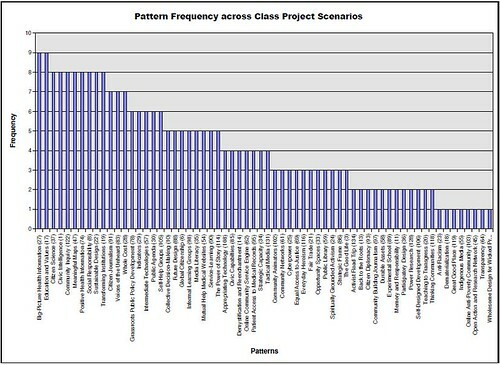 The primary source of data generated during the practicums was the Pattern Checklist, on which teams recorded the selection, relative priority and sequencing of patterns for their specific projects. Data from the Pattern Checklist also permitted the storing and rough approximation of the plotting “game boards” developed by each team. Alas, what was not captured were the rich narrative descriptions of the core issues and opportunities that emerged from the group work on these plots. 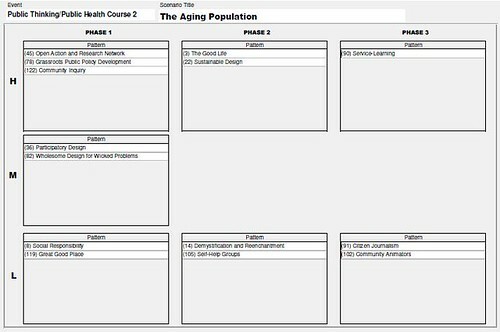 Here is a snapshot of the “game board” from the Aging Population team (as recorded by the team; some variation is noted in the photograph of the game board with pattern cards spread out more broadly during selection and discussion). 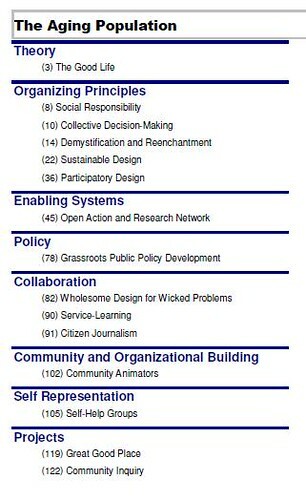 What I found interesting in this team’s work was that they selected Wholesome Design for Wicked Problems as the core of their Action Plan worksheet (see photo in the second article of this series). And finally, at the risk of venturing a bridge too far (ha!, if I haven’t already enraged professional statisticians and data analysts, what have I got to lose now! ), here is a snipit of a chart that indicates potential associations among patterns. Here’s the context: in the final preparation for publication, pattern authors were encouraged to identify possible linkages between their own patterns and the patterns written by others. Now, in the context of a practical exercise within a given domain, what other associations or linkages might appear? For example, over half of the groups that selected Social Responsibility also selected Transforming Institutions. This certainly cannot be viewed as a hard link, but might represent a potentially worthwhile consideration. What, if anything, does this all mean? In the next article, I’ll pull together my own learnings and observations from these two practicums.